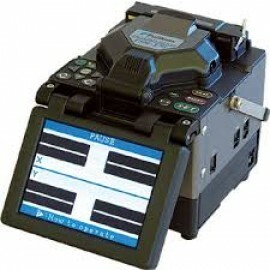 FSM-40S delivers the benefi ts of PAS core alignment splicing in a field-friendly, highly portable, mini-splicer package. Ergonomic features allow the FSM-40S to be used in diffi cult aerial taut-sheath splicing conditions, which require proper workfl ow and minimal fi ber slack. This splicer has been designed for use in harsh, outdoor conditions and features an innovative wind protector, which allows splicing in 30 mph cross winds. The FSM-40SB offers identical functionality with a front-mounted tube heater and rearmounted monitor.